In this era of distributed computing, where we spin up clusters for Hadoop, Storm, Jenkins, Cassandra, etc separately, we are not making effective use of the resources. There would be long pauses in the cluster after entering a burst of information, thus making it very in-efficient. Now, what if all these frameworks shared the same set of machines and resources, then small slices of time spent waiting for some resources could be granted to other frameworks. This is the concept of Time Sharing. Apache Mesos is a datacenter operating system and it shares the same philosophy of time-sharing. Mesos is called a datacenter because it hosts different frameworks under a single roof. It is called an operating system because shares many concepts of Linux. 2. Process Scheduler : The processes have accesses to the system resources by balancing the work loads across multiple computing resources, thereby optimizing resources, maximize the throughput, minimizing the response time and avoiding the overhead by any one resource. There are various scheduling algorithms to execute more than one process at a time (wiki:Multitasking) and also transmit multiple data streams simultaneously across a single physical channel(wiki:Multiplexing). Mesos uses such scheduling algorithms. 3. Common Infrastructure : Linux has a set of calls irrespective of filesystems, drivers etc. 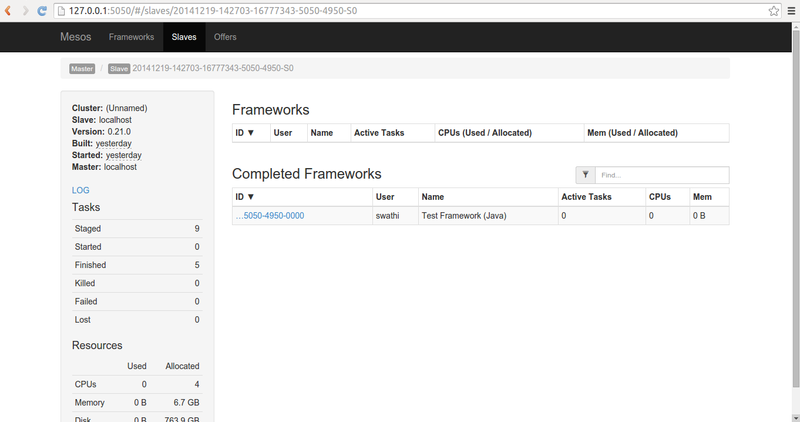 Similarly, Mesos has a common set of calls which helps in the execution of tasks. Traditionally, distributed systems has 2 components in a non-peer to peer systems. 1. Coordinator : Generate tasks, send the tasks to worker and receive results from Worker. 2. Worker : Execute the tasks and send the status and results back to Worker. With Mesos, there are three levels Coordinator, Mesos master and Mesos slaves where coordinator negotiates with mesos master and then master decides on partitioning the cluster to distribute the tasks. Thus, we can schedule jobs across the machines, thereby running hadoop, cassandra, spark etc. All the distributed systems that run on Mesos are called applications or frameworks and the coordinator is called as scheduler in Mesos vocabulary. In summary, Mesos works on a request/offer based model. Whenever, you want to run a job, you send a request. These requests are simplified subset of specification like number of GPUs, RAM etc, at that point of time. Mesos, checks for the request specification and it will reply back with the resource offers of what resources are available on a set of machines. This is non-blocking and has two level of scheduling : Offering and Scheduling. 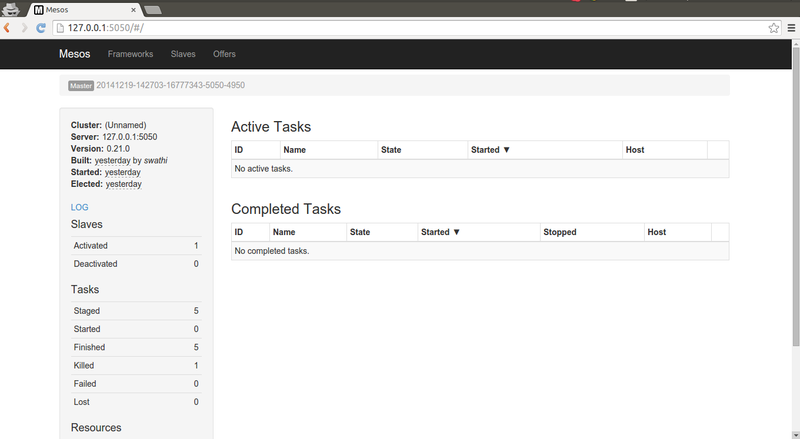 Scheduler: Uses the resource offers to decide which tasks to run and which one to run next. 1. Download the tarball from the Mirror Apache Mesos v0.21.0 and untar it. Please make sure it has appropriate permissions while building. In the next post, let us see how to build our own distributed framework on Apache Mesos.